If Sam immediately identifies with Naya, with its emphasis on Green and love of huge creatures, Jimi is likewise a devotee of Bant. The White-natured setting, the bounty of Soldiers, Knights, and other typically weenie creatures, the early aggression, all these are consistent with Jimi’s preferred mode of play. It took no prodding whatsoever to get her to rally the forces of the adoptive home of Elspeth Tirel in defense against the shambling hordes of Grixis. Here are the notes from the clash. It’s a builder opening as Jimi (on the play) lands a Bant Panorama while I field a Crumbling Necropolis. Next turn Jimi lands a Forest, then activates the Panorama to fetch an Island. I drop a Panorama of my own, and crack it for a Swamp. Jimi drops a second Panorama on turn 3 (trading it for a Plains), but I’m happy where I am. I play a Mountain from my hand and follow up with a Blood Cultist, a strong card against Bant’s weenie beaters. Things begin in earnest on turn 4. Her manabase solid, she deploys a Knight of the Skyward Eye, while I trot out a Fire-Field Ogre. The Ogre draws a turn-5 Pacifism as Jimi swings in for 2 with the Knight. I ping her with the Cultist at the end of her turn, then keep the pressure on with a Dreg Reaver. A turn-6 Guardians of Akrasa does little to help Jimi stabilise the board, and when my turn arrives I swing in with the Reaver for 4. Adding in the second end-of-her-turn ping courtesty of the Blood Cultist and Jimi is at 14 life. I’m still at 18. I play a Kederekt Creeper and pass. Now turn 7, Jimi bolsters her troops with a Steward of Valeron, then gets pinged at the end of her turn. I untap, then swing in with the Creeper and Reaver. Looking to kill the hard-to-block Creeper, Jimi offers up the Knight and Guardians to it in a lopsided trade- the Reaver gets in for 4. I ping her Guardians with the Blood Cultist so that when it dies she’ll get a +1/+1 counter, then after combat’s done I demoralise Jimi with a replacement Creeper. Next turn Jimi reestablishes her board with a Rhox War Monk and replacement Knight of the Skyward Eye. I attack as before with the Creeper and Reaver duo, and Jimi opts this time to block the Reaver with the War Monk, looking for a stabilising trade. Instead, I hit the War Monk with an Agony Warp to blunt its power, then declare my other target as her Knight, killing it outright. The powerless War Monk falls before the Reaver (with a bonus ping from the Cultist to help her grow), and once again Jimi’s board is clear. Finally on turn 9 Jimi lands a real threat, the Battlegrace Angel. It’s not enough- after wiping her hand with Blightning I have enough damage to swing for lethal no matter how she blocks. Jimi starts strong with a turn-1 Seaside Citadel into a turn-2 Knight of the Skyward Eye. I lay land. Jimi dumps much of her hand on turn 3, with a pair of Akrasan Squires touching down. She then swings with the double-exalted Knight, drawing an early Terror. Passing to me, I pounce on her three-card hand with a Blightning, taking her down to 17 life in the process. Her lone remaining card is a Rhox War Monk, which she plays on turn 4 after drawing a Plains and swinging for 3 with a Squire. I play a Vithian Stinger– bad news for the Squire brothers- and pass. Now turn 5, Jimi sends in the Rhox War Monk for 5, with its lifelink providing a massive swing (it’s now 22-12). I’m in fine shape, though, with a Fire-Field Ogre touching down. Passing to her, I use the Stinger to kill off one of the Squires during her upkeep, and having one less exalted trigger means her War Monk is only a 4/5 when he attacks this time. Still too big to block, but its time is coming. It’s now a 26-8 game, and Jimi passes. I then ping off her other Squire during my main phase before playing the fearsome Fleshbag Marauder. I sac the Marauder to himself while Jimi has no choice but to offer up the War Monk, though it’s more that served its purpose and can die with honour. I attack for 4 with the Ogre and end turn. Jimi again lands the Battlegrace Angel, this time on turn 7, but it’s immediately snuffed out with my second Terror. Jimi never recovers- over the next few turns despite a huge lead in life, my Ogre and Stinger grind her down, and I finish her off on turn 10 with an Essence Drain. Determined to claim one for the greater glory of Bant, Jimi again starts strong in the last game of the match. A turn-1 Akrasan Squire is joined by a pair of Suntail Hawks on turn 2. The beats begin almost immediately, and a turn-3 and turn-4 Guardians of Akrasa throw in more exalted triggers. It’s turn 4 before I have a play- a Blightning- and I’m down to 11 life. I buy a scrap of time on turn 6 when I Terror the lone Suntail Hawk she’s attacking with, but she replaces it with a Steward of Valeron and I realise I’ve been brutally outraced. I play a Hidden Horror (discarding a Kederekt Creeper), but with her other Hawk active it’s all but useless. She drops me to 2 life on turn 7 and lays a second Steward. I draw and scoop. In a recent Magic Beyond the Box column on Quiet Speculation, I mentioned how preconstructed play has similarities both to both Constructed and Limited. Like Limited, creature combat tends to be the overwhelming win condition of choice, and removal commands a very high premium in such an environment. Grixis Undead optimises both ends of this principle. First, it’s loaded with removal of its own. 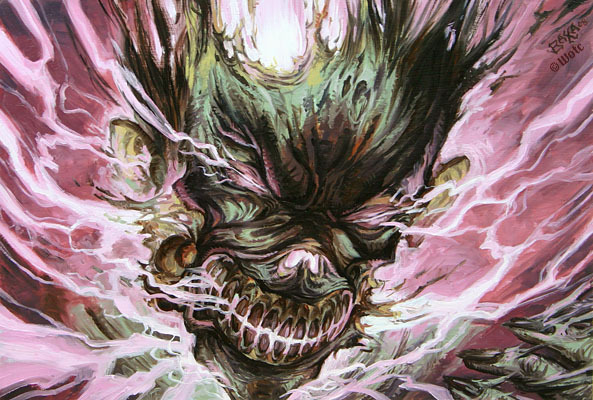 Agony Warps, Terrors, Bone Splinter and Essence Drain, added on top of the Fleshbag Marauder and pair of pingers make for a very lethal cocktail in a 41-card deck. I seldom had much trouble removing Jimi’s most offensive creatures, even if game three was poorly executed (hey, can’t win ’em all). 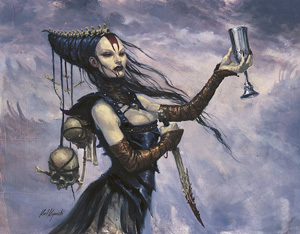 Not only can Grixis Undead dish out loads of kill, but it’s remarkably resilient against it as well. The unearth mechanic gives its creatures one last go from the grave (assuming they’re not exiled, of course), and mitigates some of the impact of losing the creature. Generally these are just extra attackers in a pinch (Dregscape Zombie, Fire-Field Ogre), but the Vithian Stinger can come back for a ping when needed. You may find as well that the threat of extra beaters from the grave may have a slight suppressive effect on your opponent as well, causing them to hold bodies back for defense rather than go in on the offensive with them. If there’s a downside to the deck, its in the selection of Cruel Ultimatum as one of its two rares, which for reasons discussed in the deck analysis, but that’s not a dealbreaker by any stretch. And who knows, once in awhile you’ll get to live the dream of actually casting it! The tri-color lands in this set are beautiful. This deck makes me really look forward to the Bolas deck. Great review! How do you store all your pre-cons? Do you put them in Deck-boxes sleeved? What brand of sleeve are you currently using? So far I’ve just been using an Ultra Pro Deck Box with them sleeved in Ultro Pro White sleeves. The kind that come bundled with two packs of 50. Don’t really know how I’m going to store all these things. However, a question to ErtaisLament: In which way do you determine the Intro Pack serving as a sparring partner for the deck you are compiling any given review? Good question! Generally, I leave that to my opponent, with the caveat that they cannot pick a deck which has already served as an opponent. It wasn’t always that way, but somewhere along the line I decided that each deck should get a chance at serving as opposition. I’ll confess to being a touch… obsessive… when it comes to storing them. Each precon is sleeved in UltraPro sleeves, the ones with the five mana symbols on them. Then they are stored in UltraPro deck boxes. Here too I’m particular- the deck boxes must be the top-loading ones that were released for that particular set. In the event a set didn’t get any ‘official’ deck boxes for it (earlier sets), then I use a flat black UltraPro deck box instead. I print and laminate an insert for each one that has the name, colours, and reprints the blurb from the back of the box. Finally, I store them in the fat pack cards boxes for that particular set. Each box can comfortably hold three decks, so in almost every case I have to use two. I’ve been acquiring additional fat pack boxes with the intention of modifying them for those sets which didn’t have fat pack card boxes released. It’s an ongoing project, I don’t have all of my precons ‘processed’ yet but I always try to when it comes to review time. I sleeve everything too. I buy the 100 pack ultra pro blacks. Every three packs I have enough for a 4th deck, so it works out. Far better than those 50 packs. A little cheaper per sleeve too. The only thing in set specific boxes is the duel decks for me. The rest I try to get a box that fits the deck. IE: Elves in Elve deck box so I know which it is, but sadly there aren’t too many I can find fitting for most of them. I toss those into the appropriate mana symbol ultra pro box. I do love your idea of printing the blurb. Since I slap in each box a printed deck list, I could easily put that on the back. That’s a great idea right there. Really would give others a “feel” for the deck by that in most cases. I wish that there were more deck boxes made, but alas they only go so far back. Still, a lot of “promotional” boxes were released and resurface from time to time on eBay. Do you and your family usually just play with a deck from the same set or how often do you play other decks from other sets against each other? We’ve done a lot of playing with different sets for fun, just not ‘officially’ for review. That said, you might enjoy our Preconstructed Championships series, where all decks of a given annual season are pitted against each other in March Madness style. 2009-10 was released a few months ago, and we’ll be going both backwards and forwards with the series. 2008-2009 is actually in the beginning planning stages already. Sweet! Time to get our imaginary betting stashes ready. I think a contest and brackets is in order for the next championship. Whoever is closest gets a card or a deck or a post on the back. I mean a pat on the back. Funny you say that… I gave serious consideration to making a contest out of it the last time, like March Madness office pools. I’ll have to look into it and see if it runs too close to gambling. I have no problem with gambling personally, but I know Wizards has good reason to keep their game divorced from it. Although that makes for easier bracketing, I’d like to see each “class” stand on its own. The upcoming one this Spring will feature Alara Block and two Duel Decks (Jace/Chandra and Divine/Demonic) off the top of my head. 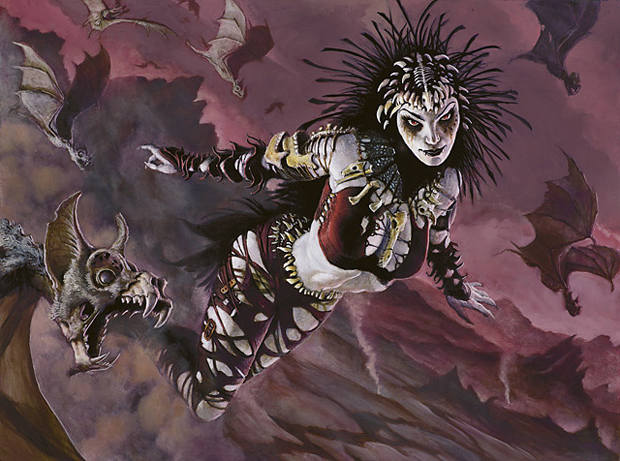 Still going back and forth about the MODO decks for Master’s Edition II. 2007-08 this Summer would then have Lorwyn/Morningtide, Shadowmoor/Eventide, Tenth Edition, and Duel Decks: Elves/Goblins. This Autumn would be the going-forward of 2009-10 (Scars block et al), then back to 2006-07 this Winter. Eventually we’ll do them all and then it would be just an annual event. But yeah definately looking forward to seeing the next Championship. I’ll be looking forward to the face-offs. 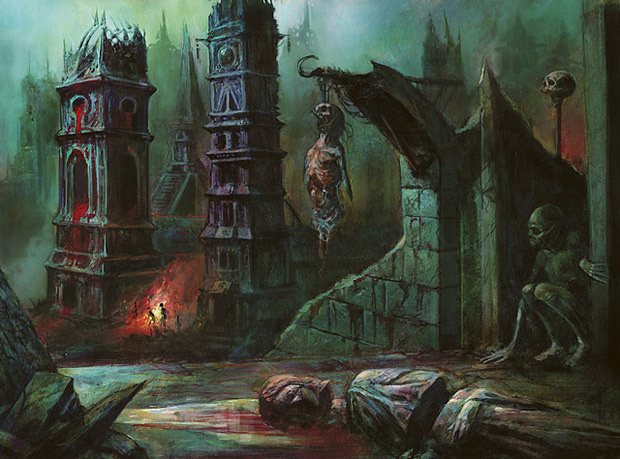 Slightly off-topic, do you ever plan to do a Meddling column on each of the Mirrodin Besieged sets? I plan to take some of your advice and eventually improve the Scars sets and was wondering. You’ll be happy to know that they’re in the works as we speak, and should have the first one up by next week-end. Glad you enjoy!